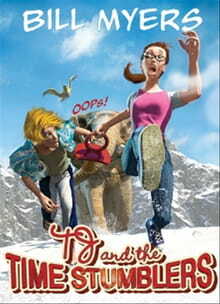 TJ and the Time Stumblers: Oops! EDITOR’S NOTE: The following is an excerpt from TJ and the Time Stumblers: Oops! (Book #3) by Bill Myers (Tyndale House Publishers). All-school bully from the future stopped by. Despite his disguise, Tuna and I are positive it’s Bruce Bruiseabone, winner of the Worst Breath in the World Contest. We fear he could really zwork things up for our subject (who, by the way, is still smoot to the max). Thelma Jean Finkelstein, better known as TJ to her friends (all four of them—unless you leave out her goldfish and pet hamster, which brings it down to two friends), ran through the empty cafeteria, screaming her lungs out. “Why is he chasing us? Now, you might call her behavior a little weird (which may be why she has only two friends). But weirder than that weirdness is that the HE in her little screamfest just happened to be an African elephant the size of a Chevy pickup who, unlike a Chevy pickup, had some very bad breath. Weirder than that weird weirdness was the US TJ happened to be screaming about. And who, exactly, was the US? First, there was Thomas Uriah Norman Alphonso the Third. Or for those who don’t enjoy spraining their tongues, Tuna. On TJ’s other side ran Herby, a tall surfer dude with long blond bangs and the exact same number of brain cells as TJ had friends (after you subtract the goldfish and hamster). The boys had traveled back in time to do a history report on TJ because, believe it or not, someday when she was through screaming her lungs out and being chased by African elephants through school cafeterias, TJ would become a great world leader. The good news was Herby transported them out of the cafeteria. The bad news was he missed TJ’s house (unless she had moved to the top of Mount Everest). The top of Mount Everest! you say? “How odd!” Tuna yelled over the howling wind. back to school and were running down the hallway toward the auditorium. That was the good news. But as you may recall, every time TJ gets a little good news, she gets a ton of bad. In this case, it came in the form of one African elephant (whose breath had not improved) who was still running after them. And (since we’re having a two-for-one special in TJ’s bad luck department) there was the added problem of Hesper Breakahart, star of her own TV series on the Dizzy Channel (and the richest, most gorgeous, most spoiled 13-year-old in the entire civilized world— and maybe Texas, too). At the moment she was inside that very auditorium holding auditions for her TV show. “That’s right,” Hesper said, flashing her perfect, glow-in-the-dark, bleach-toothed smile. Every little-sister hopeful’s hand shot up like they all had to go to the bathroom. Chad Steel glanced up from the homework he was doing at the back of the auditorium. Earlier, Hesper had asked him to swing by and give her some emotional support. It seemed Hesper always needed his emotional support. And since they were supposed to be “a couple” and since Chad was the nicest guy in school, he helped her out when he could. At the moment “helping out” meant watching Hesper audition her fellow students for a tiny part in her TV series. Lately, she’d been making so many enemies (courtesy of the New Kid) that Hesper figured this would be a great way to play kissy-kissy to everyone. But Mr. Beaker, the science teacher, had definitely gone too far. Honestly, who did the guy think he was fooling by wearing that wig and miniskirt? The point is, everyone wanted to be a star. Which meant they were all slaves to Hesper Breakahart’s slightest whim. “Are you ready?” the director asked. “Really?” Elizabeth squealed in delight. one very loud and very frightened New Kid ran in. To be honest, Chad wasn’t entirely surprised. It seemed the New Kid was always doing unusual things—which in a strange way he found kinda cute. Not that he had a thing for escaped mental patients, but ever since she moved in next door to him, there’d been something about her he found . . . interesting. “Why is he still chasing us? but as far as Chad could tell, there was no US being chased. It was just the New Kid. But even more interesting was the fact that she was being chased down the aisle by an African elephant. Naturally, everyone screamed and panicked. And those girls who had been raising their hands like they had to go to the bathroom? Well, this time it was for real (and it might have been too late). Without thinking, Chad leaped to his feet and ran toward the New Kid and her peanut-eating pet. He wasn’t sure why. Maybe he thought even mental patients deserved protection from runaway elephants. Whatever the reason, he’d read that the best way to handle wild animals was to stand up to them and not be afraid. This would explain his running down the aisle, waving his arms, and screaming like a madman. Either that or he’d caught whatever mental disorder the New Kid had. In any case, the elephant continued speaking. Instantly, everything was back to normal—well, except for those girls racing to the bathroom . . . and the lingering bad breath of an African elephant who had just vanished from everyone’s sight.